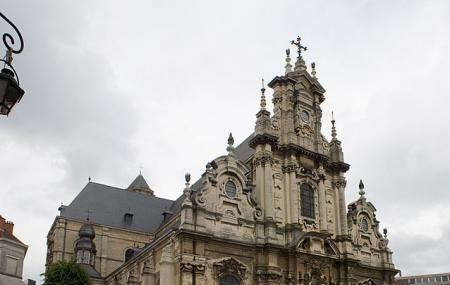 Find hotel near Eglise St. Jean Baptiste .. The Beguines were lay women of medieval, not sworn to the church but associated to it. When in the 13th century their numbers swelled a Gothic church was built for them at this location. Here they wove wool and made lace, sustaining themselves. In the 17th century they contracted Lucas Faydherbe to renovate their church. So he built them a stunning Italian-Flemish style Baroque church, with a facade that is still considered to be Belgium’s most beautiful. Inside the church you will find paintings by various Flemish artists, a wooden Baroque pulpit, and wide aisles. Today the church helps out asylum seekers and provides them with small jobs, much like it did with Beguine women long ago. Times may not be accurate. Call the church before your visit. Very nice church, free to visit.